Walked a mile and a half downtown for breakfast — our B&B is lovely in many ways, but breakfast is not its specialty. The cherry-rosemary scone at Trattoria Centrale, on the other hand, is out of this world. And it was really interesting to walk through the streets of Birmingham rather than driving. This is a surprising city; much of the area surrounding the downtown is unexpectedly warehousey and distinctly non-southern in feel. This section of town feels almost western: broad streets and buildings low to the ground, with little attention to aesthetics. 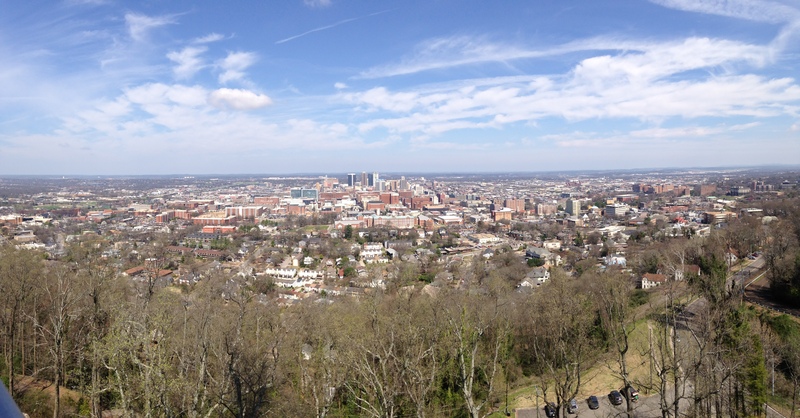 This makes sense; founded in 1871, Birmingham is an unusually young city for this side of the Mississippi. And the people who first mapped it out imposed a rigid grid system onto the once-farmed landscape, so it feels very blocky. The downtown is pretty small. It has some beautiful buildings, most of which were built between 1890 and 1920, which is when Birmingham transitioned from being just a lot of iron and coal mines into a real city with booming steel mills and other related industries. Many of the skyscrapers from that period are still standing. 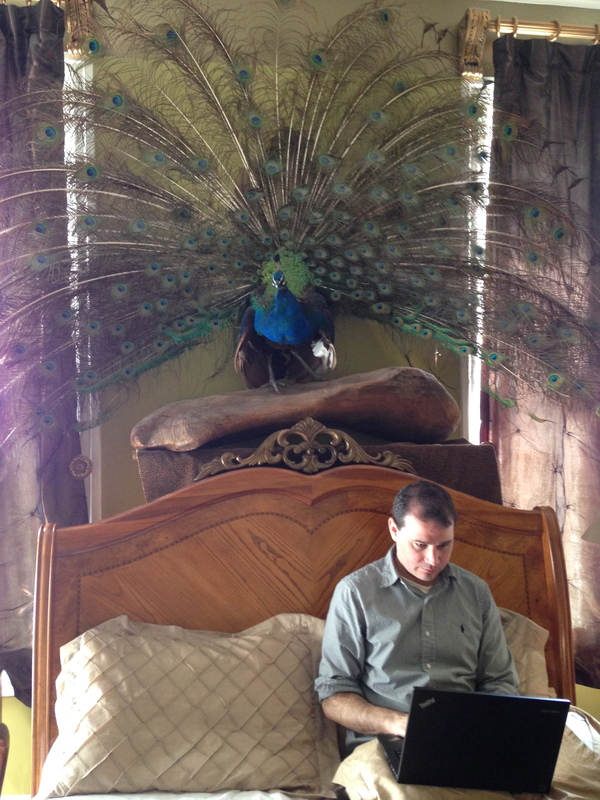 After returning to our hotel room to do a little more email — here’s Prescott in work mode — we said goodbye to the B&B and went out to explore new corners of the city. Today was the opposite, in many ways, of what we’ve done thus far on our trip: today we followed the steps of the wealthy people of Birmingham. 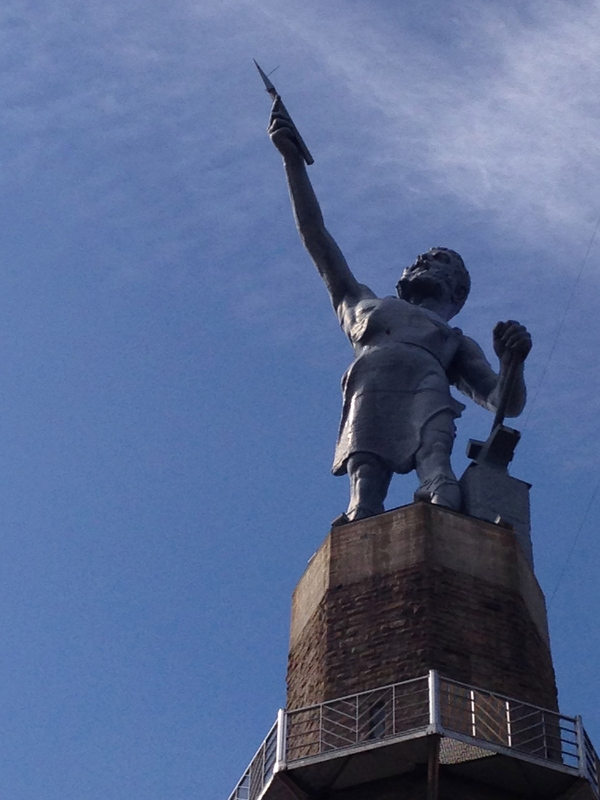 Our second stop was a visit to see Vulcan (to whom Prescott has given the pet name “Spock on a Stick”), the largest cast iron statue in the world. 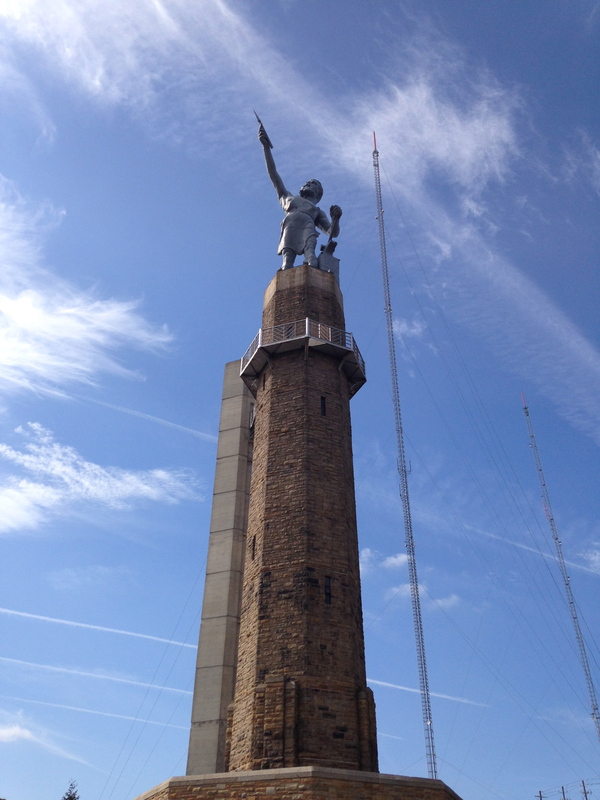 Built for the 1904 World’s Fair in St. Louis as a way to demonstrate Alabama’s greatness to the world, Vulcan now stands on a tall stone pedestal atop one of the ore-rich hills that line the south side of town. 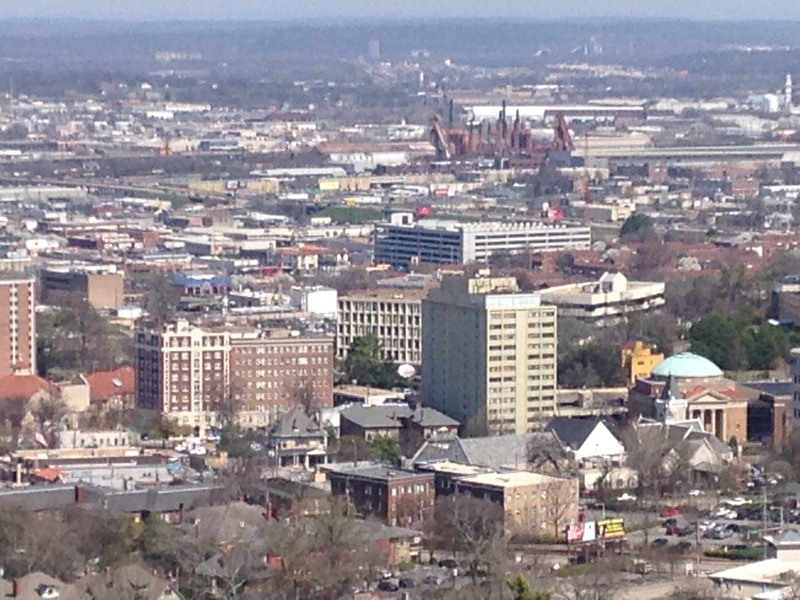 A visit to Vulcan Park comes along with (1) a wonderful museum that teaches visitors all about Birmingham’s history (which is pretty fascinating even before the city goes into decline and needs a serious civil rights overhaul) and (2) an observation tower at Vulcan’s base (which you can see in the photo above) from which you can look out over all of Birmingham. The photo above will be interesting only to people who have been to Birmingham and who are willing to squint at their computer screens, because in it you can see three sites of interest: the Sloss Factory (in the background with all of the smokestacks, the only blast furnace that’s a National Historic Landmark); the reformed synagogue of the Five Points neighborhood (the green dome toward the front right); and our B&B (a mansion that’s dwarfed by the giant blocky beige apartment structure two buildings to its right in the foreground). 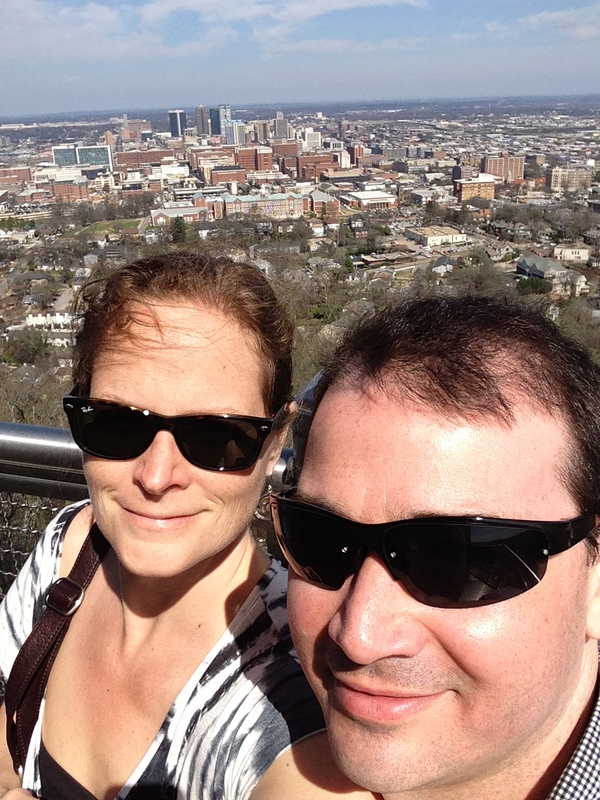 Our next stop was Mountain Brook Village, a planned community that houses some of Birmingham’s wealthier denizens. We went there because a friend told me that it was cute and had good shopping; we would say that it’s like Roland Park with bad traffic and lots of very expensive and fancy shops. But it does have an old diner called Gilchrist that makes one mean limeade. 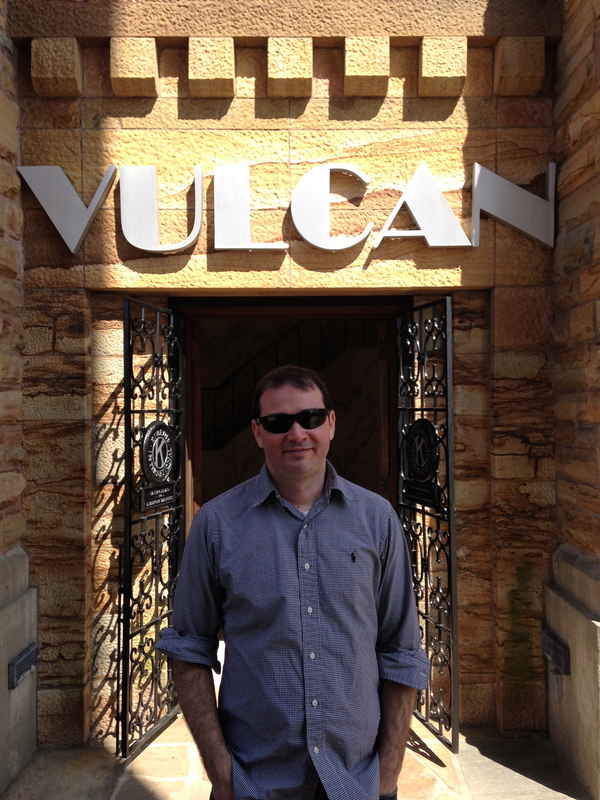 Lunch was at Chez Fonfon, a French restaurant with the best grilled asparagus I’ve ever eaten. Frank Stitt, who owns and continues to work as a chef at three of the restaurants we visited on this trip, is a genius. Our last stop of the day was the Birmingham Museum of Art, where we went to see an exhibit called “Small Treasures: Rembrandt, Hals, Vermeer, and Their Contemporaries.” It was a tiny jewel of a show, nicely curated and well worth the visit. 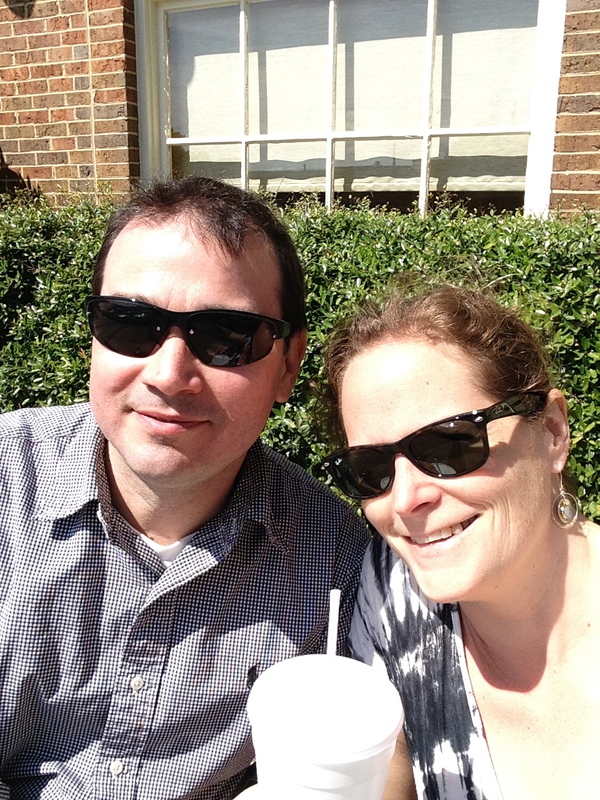 We then sat in the sun in the sculpture garden — it’s been 75 degrees and sunny for three days running — before heading out to the airport. Bye Alabama — thanks for a fascinating trip!